Everyone needs a good granola recipe up their sleeve. 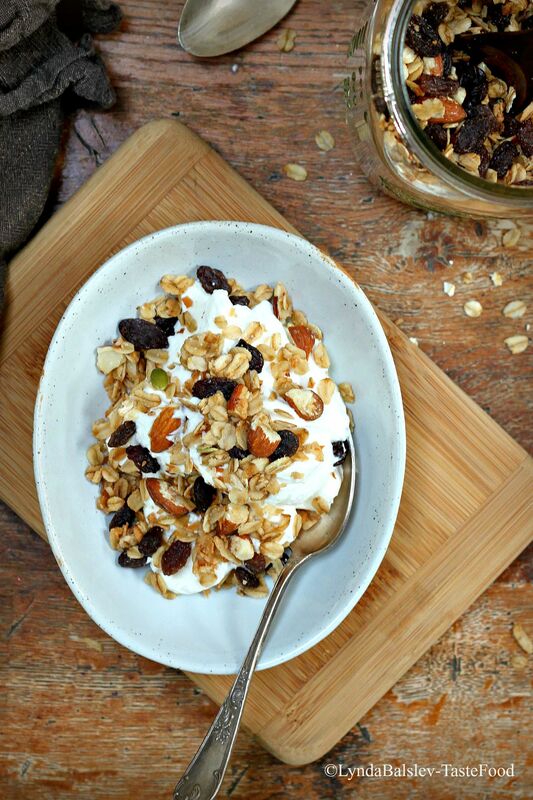 Homemade granola is a healthy pantry staple, great for quick breakfasts and wholesome snacks. It’s also very easy to make, requiring only 30 minutes. I follow a basic ratio of 2 cups oats to 1 cup coconut to 1 cup nuts to 1 cup dried fruit. To that I embellish, adding different grains and seeds such as flax, sunflower, or even wheat germ, depending on what I have on hand. Use this recipe as a template and mix and match your favorite nuts, fruit, and seeds to your taste – and consider doubling the batch, because it’s guaranteed to be gobbled up. Be sure to add any of the fruit after the granola has cooked to prevent the fruit from burning. Makes about 5 cups. Preheat the oven to 300°F. Combine the oats, coconut, almonds, pepitas, and salt in a large bowl. Whisk the syrup, sugar, oil, vanilla, and cinnamon in a small bowl. Pour over the oats and stir to thoroughly coat. Spread the mixture on a rimmed baking sheet lined with parchment or a silpat. Bake until light golden, about 25 minutes, stirring once or twice. Remove from the oven and add the raisins, stirring to blend. Cool completely. Store at room temperature in an airtight container for up to one week. This recipe also appears in my Food and Drink column at Marin Magazine. I love granola and preferred homemade to control the sugars. It is so good topping yogurt in the morning and a wonderful treat for the kiddos! I ended up buying a lot of bulk cocoa granola on sale and I want to make some bars for my long runs, training for a marathon and I’d prefer homemade bars over gels. Reps!! !